Both moms and dads work extremely hard to make sure their children are provided for. Whether both parents leave the house for work doesn’t detract from the fact that simply having kids is a massive undertaking, and a job in and of itself. So, when this little girl’s daddy finally made it home after a long workday? He had a very special way to welcome her, and I must say, I’m very glad it was all caught on camera. 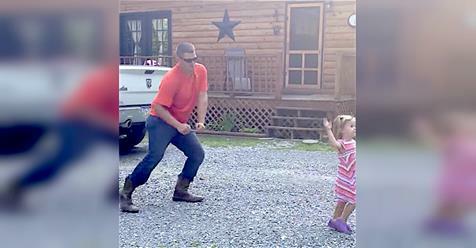 By cranking up the radio and leaping out of his truck in shiny cowboy boots, Justin Price is ready to lead a dance with his 2-year-old daughter Malli. They boogie down to Ke$ha’s “Timber,” a well-known favorite of many, but it’s when Price swings his daughter up into his arms that the video really gets adorable. There are so many cute videos like this one! Remember the dad who lip-synced to a Frozen song with his daughter? Or the daddy-daughter team who danced in the car? It’s really amazing that this dad was able to put in the long hours at work only to come home and start dancing! You can really tell just how much he adores his little girl, and, of course, just how much Malli adores him. This makes me want to get up and dance, too! Did you ever have fun rituals like the Price family whenever someone came home? I’d love to hear about them.